One of the best quality growing mediums around. 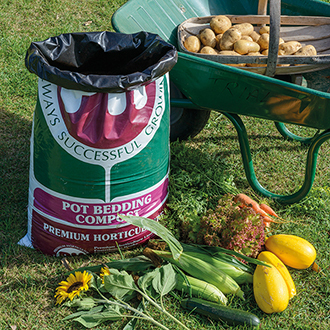 This premium potting compost is British made by a small, independent manufacturer. A medium grade, easy flowing, peat based, sphagnum moss blend, it contains a well-balanced feed and a wetting agent to retain moisture. Works on anything from trees to shrubs and bulbs to veggies and bedding plants, in addition provides a great top dressing around established plants to give vigour. Tried and tested by our trails ground team and delivered direct to your door! Moisture content 65%, ph value 5.5. Please note that due to size and weight restrictions there is a MAXIMUM OF TWO BAGS PER ORDER. For larger quantities, please see our bulk items featured below or place multiple orders.